Irish feature film ‘Songs for Amy’ has been awarded the ‘Outstanding Achievement in Filmmaking’ prize at the Newport Beach Film Festival in California. The film, which received its US premiere at the festival last Tuesday, also ranked fourth out of 400 films on the audience ratings at the festival. The darkly comedic love story was filmed in Galway and New York and stars Irish actor Kevin Ryan (Raw, Copper), Sean Maguire (Meet the Spartans), James Cosmo (Sons of Anarchy), Lorna Anderson (River City), Gavin Mitchell (You Instead) and Patrick Bergin (Sleeping with the Enemy). Produced and written by Fiona Graham for Sonny & Skye Productions and Seafaring films, ‘Songs for Amy’ follows Sean (Maguire), a tormented Irish musician who writes an album for the love of his life, Amy (Anderson). His journey to win her back takes him through love, loss, regret and hope, all with the help and hindrance from his bandmates. 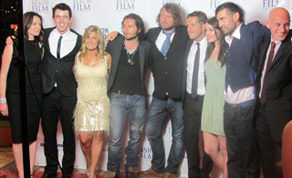 Actors Maguire, Anderson, Ryan and Ross Mac Mahon all attended the US festival, along with Begg, Graham, executive producer Mairi McLellan and musicians Jim McKee and Ultan Conlon, who performed songs from the film’s soundtrack at the festival. ‘Songs for Amy’ will receive its Irish premiere at the Galway Film Fleadh in July.